Do you have a newborn baby or a toddler? Your baby will spend hundreds of hours sleeping, so investing in a high-quality crib mattress that provides a safe sleeping environment and supports their growth is one of the most important things you will do when preparing their bedroom. Many mattresses, unfortunately, contain chemicals and toxins when manufactured, so it’s recommended that you keep your baby safe from exposure to these potentially harmful substances by getting a non-toxic crib mattress. It’s also important to know that not all mattresses labelled as organic are, in fact, 100 percent organic and these mattresses can still contain potentially harmful materials. For example, a mattress can be labelled as organic because it contains organic cotton filling, but the cover could still be made from PVC plastic or vinyl, which can be an extremely toxic material for your baby to breathe in while they sleep. Non-toxic filling: Many crib mattresses use polyurethane foam for the filling material, which is made from petroleum and is highly flammable. Polyurethane can also contain many chemical additives, including formaldehyde and benzene. 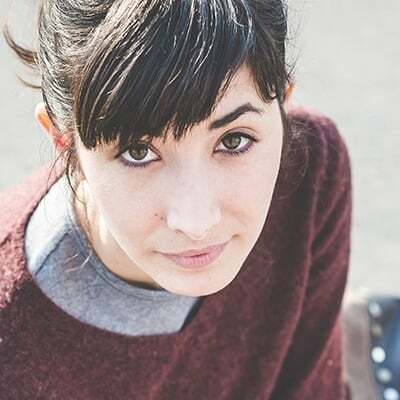 Finding a non-toxic mattress with a filling such as organic wool, cotton, or natural latex is a safer option, provided the cover is also non-toxic. Certifications: If a mattress is not 100 percent organic, having an accredited certification such as CertiPur-US or Greenguard generally guarantees the safety of the materials used within the mattress. This is a good indication that the mattress you are looking at has been tested and approved to be in line with current standards. With so many different crib mattress options to choose from and a wide range of materials and features available, it can be difficult to be sure you are choosing the mattress that is best for your baby. With this in mind, we picked the Naturepedic No Compromise crib mattress as our number one pick because it offers one of the safest, non-toxic options for your baby. The organic cotton filling provides a pure and non-toxic environment for your baby, while the polyethylene cover is one of the safest ways of providing a waterproof cover for your crib mattress that includes no harmful chemical additives. Overall, this is a high-quality mattress that has your baby’s health and comfort in mind in every step of the design. Keep reading for our other top recommendations for the best non-toxic crib mattresses that are either fully organic or include organic materials – take a look at the options we’ve listed below to find the best option for you and your child. 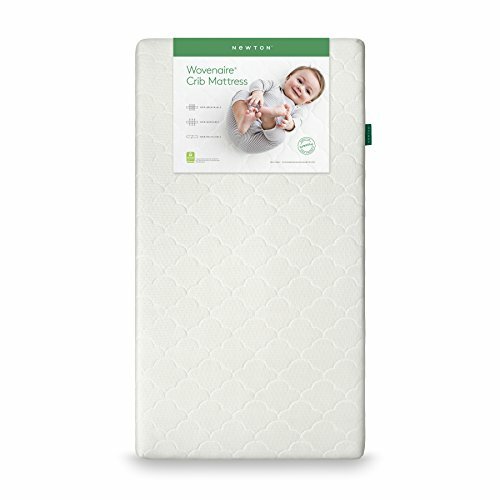 The Naturepedic No Compromise Organic Cotton Classic Crib Mattress is a fantastic option for your baby, offering a 100 percent waterproof and stain-resistant cover that is easy to keep clean from bed-wetting and spills. Naturepedic mattresses are made in the USA and are GOTS and GREENGUARD certified, so you know you’re investing in a mattress made of quality, non-toxic materials. You want a waterproof mattress: The Naturepedic No Compromise mattress has a food-grade polyethylene cover to provide a stain-resistant and non-toxic waterproof surface that is easy to clean. You want a mattress that has firm support: This mattress provides firm comfortable support designed in accordance with pediatrician and Consumer Product Safety Commission (CPSC) recommendations. You want an innerspring mattress: The Naturepedic No Compromise mattress is made with heavy-duty, 150-coil innerspring construction with strong, 9-gauge edge support, designed to provide the perfect balance between strong support and cloud-like comfort. You want an allergen-free mattress: This mattress is made with no soy or latex and has a built-in dust mite barrier, so there’s no need to worry about this mattress containing high-allergen materials. The Naturepedic No Compromise Organic Cotton Classic Crib Mattress is made with 150 coils, with reliable, 9-gauge edge support to prevent slip-offs and sinkage. It also contains a certified organic cotton filling from USDA approved sources, to provide a comfortable yet firm sleeping surface for your baby. The mattress contains no latex or soy, which, depending on your baby, can be potentially high-allergen materials. What’s more, the food-grade polyethylene, waterproof cover provides a built-in dust mite and bed bug barrier that is easy to clean, highly stain-resistant, and made from an environmentally-friendly material. While not organic, the cover meets non-toxic standards for a safe way to waterproof your crib mattress. The firmness of the mattress means is designed in accordance with pediatrician and CPSC recommendations and is described as providing a ‘firm, comfortable’ surface that will help your baby sleep peacefully and safely. What’s more, all Naturepedic crib mattresses are GREENGUARD Gold certified, use GOTS-certified materials, and are certified to be formaldehyde-free, with regular tests carried out on the products for chemical emissions. Naturepedic mattresses come with a lifetime limited warranty, so you can rest easy that you’re investing in a mattress built to withstand the test of time and one that provides a safe, comfortable surface for your baby. The Newton Wovenaire Crib Mattress is a 100 percent recyclable mattress, designed to offer maximum airflow for excellent temperature regulation throughout the night. This crib mattress is a high-quality choice, featuring a number of innovative features for a comfortable, safe, and toxic-free sleeping environment for your baby. You want a washable mattress: The Newton Wovenaire Crib Mattress is fully washable, allowing you to keep the mattress clean, fresh, and hygienic by simply popping the cover in the washing machine and cleaning the Wovenaire core in the bath or shower. You are looking for an environmentally friendly mattress: This mattress has the added benefit of being 100 percent recyclable and contains no foam, latex, springs, glue, or allergens. You want a breathable material: The Newton Wovenaire Crib Mattress is topped with a 3D spacer cover, comprised of two layers of highly breathable fabric that are designed to allow air to flow freely through the mattress. You want to be able to test before you buy: You’ll get a 100-night sleep trial period with this mattress, giving you plenty of opportunities to decide whether the mattress is right for you and your baby. The Newton Wovenaire Crib Mattress is simple in its construction, consisting of simply a layer of foam and a cover. The mattress is actually 90 percent air and 10 percent food-grade, low-density polyethylene (LDPE), a plastic that is often used in milk cartons and grocery bags. The cover is made out of two layers of 3D spacer polyester fabric that is quilted together, to create an extremely soft and breathable surface. One of the most distinctive features of the Newton Wovenaire Crib Mattress is its breathability – the mattress is reportedly 97 percent more breathable than a traditional crib mattress. It is designed with maximum airflow in mind, allowing air to circulate freely through the mattress, which dissipates body heat for excellent temperature regulation. Another fantastic feature of the Newton Wovenaire Crib Mattress is that it is 100 percent washable, helping to reduce bacteria build-up and maintain a hygienic sleeping environment for your baby. The benefit to this is that rather than relying on a waterproof cover that can, in some cases, contain vinyl, the soft and breathable cover of the Newton Wovenaire can simply be washed on a regular basis, to keep it clean and stain-free. This mattress has a firm feel, providing the perfect breathable, supportive surface that reduces the risk of suffocation and SIDS, while still offering comfort to your child as they sleep. The Newton Wovenaire Crib Mattress is completely free from foam, glue, latex, springs, free of harmful chemicals, and 100 percent recyclable. The brand’s GREENGUARD Gold certification can also attest to these features and proves that the mattress is free from off-gassing and any toxic chemicals. Finally, the mattress offers a 100-night sleep trial period, with a full refund available within those first 100 nights, if you decide that the mattress is not suitable for you or your baby. We included this mattress on our list because of its commitment to providing a chemical-free mattress for your child. While the mattress is not certified as 100 percent organic, the food-grade polyethylene core and breathable polyester cover are Greenguard Gold certified, meaning they are free of toxic chemicals and off-gassing, while the washable core and cover make it easy to keep your crib mattress free from any harmful bacteria. The Nook Pebble Pure crib mattress is an all-in-one sleep system designed to be used as sold, without the need for any additional sheets, pads, or covers. 100 percent organic from the core right through to the cover, this premium mattress provides a natural and healthy surface that gives you the peace of mind that your baby is sleeping safely and soundly. You want a 100 percent organic mattress: The Pebble Pure crib mattress is made from 100 percent organic materials, from its natural coconut coir, organic wool, and a Talalay latex filling, to its eucalyptus and organic cotton blend cover. You have a larger budget: When it comes to organic products, you often get what you pay for. With that in mind, the 100 percent organic Nook Pebble Pure mattress comes with a higher price tag than your average crib mattress. You want a breathable mattress for your baby: This mattress boasts being so breathable that your baby can actually breathe through the mattress. What’s more, the natural fibers in the cover can help to wick away excess body heat, providing a cool and comfortable surface for your baby to sleep all night through. The Nook Pebble Pure crib mattress is constructed from 100 percent organic materials. The filling consists of a layer of Talalay latex and another layer of coconut coir (the brown husk from the coconut), both of which are then encased in a layer of organic cotton that provides a natural flame barrier without the needed for any chemical flame retardants. The latex and coconut coir layers have the added bonus of providing a firmer side suitable for infants (the coconut coir side), and a more supple side suitable for toddlers (the natural latex side), so the mattress can adapt as your child grows. 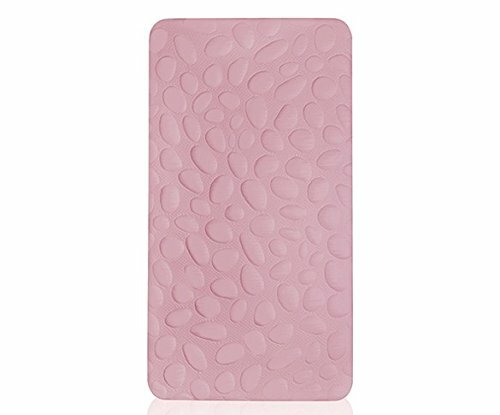 The cover on the Nook Pebble Pure is made from a blend of eucalyptus and organic cotton and is designed to be used without an additional sheet or pad. The cover is removable and machine washable, to help you easily keep the mattress clean and free from bacteria and it is also dipped in a natural NanoSphere® bath, to make it water-resistant for added convenience. What’s more, the distinctive asymmetrical Pebble design on the cover isn’t just for aesthetics – it’s designed to provide optimum breathability and promote airflow while your baby sleeps. One of the best features of the Pebble Pure is that it’s so breathable that your baby can breathe through the mattress – the brand recommends holding a hairdryer up to the mattress and feeling the warm air on the other side to test this feature for yourself. Nook markets itself as a non-toxic manufacturer, using no chemical flame retardants or other chemicals in the design of their mattresses. The Pebble Pure instead features an organic wool layer to act as a natural flame barrier without the need for any additional chemicals. What’s more, the materials used are also hypoallergenic, so you can sleep easy knowing your baby is sleeping on a surface that will keep them itch-free and safe from toxins. Overall, this is an extremely high-quality organic crib mattress with thought and care put into every aspect of the design. Although you will be paying a premium price, this 100 percent organic mattress provides the ideal natural, non-toxic sleeping environment to give you the peace of your mind that your baby is safe while they sleep. The Emily Natural Crib Mattress by My Green Mattress is a 150-coil innerspring crib bed that was first designed for the founder’s daughter, who suffered from eczema and allergies, inspiring the family to switch to all-natural materials in their lifestyle. Made with natural wool, organic cotton, and zero petrochemicals, this natural crib mattress is excellent value for an affordable price. You are looking for an innerspring mattress: The Emily Natural Crib mattress is a 150-coil innerspring mattress and is highly rated for having the right level of firmness to provide a safe and comfortable night’s sleep for your child. You want an all-natural mattress: Made with organic cotton and natural wool, this innerspring mattress is free from any petrochemicals. You want a hypoallergenic mattress: The natural wool used on the mattress cover is free from pesticides, herbicides, antibiotics, and hormones, and is also naturally resistant to mold, mildew, and dust mites, for a healthier sleeping surface for your baby. You want to test before you buy: The Emily Natural Crib mattress comes with a 100-night trial period, so your baby can try the mattress before you fully commit. The Emily Natural Crib Mattress, by My Green Mattress, is a 150-coil innerspring mattress with a quilted cover made from GOTS-certified organic cotton and Oeko-Tex certified natural wool. The mattress has a ‘just-right’ level of firmness, offering the perfect balance between comfort and safety for infants. The Emily Natural Crib Mattress is an excellent option for an organic crib mattress, as it promotes an all-natural, healthy sleep for your baby and is GREENGUARD Gold certified. The natural wool cover makes the mattress naturally flame retardant with no chemical flame retardants and also uses no harsh chemicals, dyes, or bleaches, during processing. What’s more, the wool is also free from chemical components, such as pesticides, herbicides, antibiotics, and hormones, creating an organic and toxic-free sleeping environment for your baby. Wool is also naturally resistant to dust mites, mold, and mildew, helping to keep your baby’s sleeping surface free of unwanted allergens. The Emily Natural Crib Mattress comes with a 10-year warranty, as well as a 100-night sleep trial period, to allow you to try the mattress before you buy. Overall, we like this mattress as it offers some fantastic features for a non-toxic crib mattress for your baby and has the certifications to show for it. With a GOTS-certified organic cotton quilted cover and Oeko-Tex American wool sewn in underneath, this mattress prioritises natural, safe materials to provide a healthy sleep surface for your baby. The Moonlight Slumber Little Dreamer Crib Mattress is an eco-friendly, antimicrobial, dual-sided crib mattress, designed to provide a comfortable, safe sleeping environment for your baby. With an extra-firm side perfect for young infants and a softer side for toddlers, this organic mattress will continue to offer excellent support for your child as they grow. You want a dual-sided mattress: This is a dual-firmness foam mattress, making it ideal for babies who need a firmer surface, as well as for toddlers who may feel more comfortable on a softer mattress. You want a mattress free from flame retardant chemicals: The Moonlight Slumber Little Dreamer Crib Mattress is free from polyethylene, PVC, and vinyl, with no flame-retardant chemicals used in its construction. You are looking for a water-resistant cover: As an added bonus, this water-resistant mattress has been designed to be cleaned with a damp sponge and water, allowing you to keep the mattress clean and hygienic at all times. 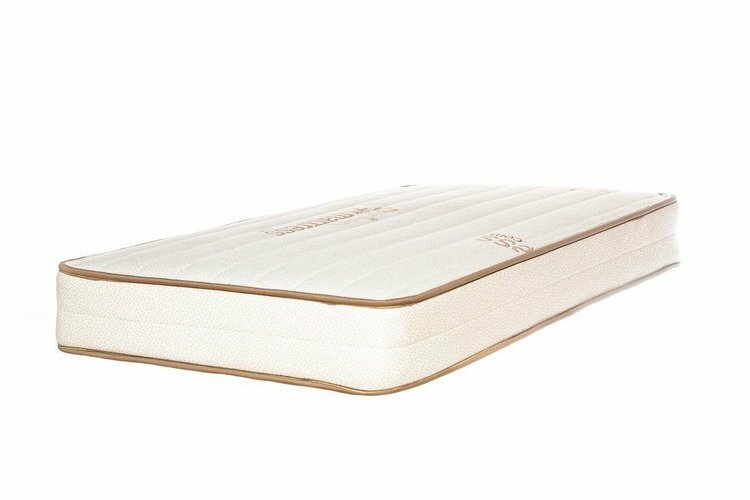 The Moonlight Slumber Little Dreamer Crib Mattress is a high-quality, plant-based foam mattress, constructed from extra firm, high-density foam on one side and another layer of firm, high-density foam on the other. The mattress is then covered with a medical-grade stretch knit fabric that protects the mattress from dust mites and bed bugs. 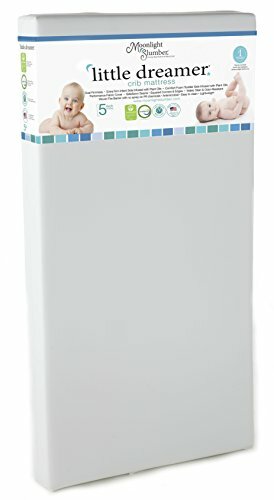 The dual-sided construction of this mattress is designed to provide the recommended level of comfort for your baby as they grow, with the extra-firm side most suitable for infants until they are nine months old and the softer side providing a more comfortable surface for toddlers nine months and over. The mattress cover is made from a water-resistant, medical-grade fabric, designed to keep the mattress free from bacteria and easy to clean with a damp sponge. This fabric is also extremely durable, antimicrobial, and odour resistant, forming a woven fire barrier that requires no chemicals to meet flammability recommendations. The Moonlight Slumber Little Dreamer Crib Mattress is free from vinyl, polyethylene, phthalates, and PVC, with no flame-retardant chemicals used in its construction. The mattress is also CertiPUR-US certified and complies with the Green Safety Shield Quality Assurance program. Overall, this dual-sided organic mattress is extremely helpful for ensuring your baby has a safe, firm mattress to sleep on when young, but can easily be flipped to the softer side, as your baby gets older. The Moonlight Slumber Little Dreamer is not a 100 percent organic mattress, although it is Greenguard certified as being free from toxic chemicals. We choose this mattress for our list because of its simple construction and the company’s commitment to providing an affordable, antimicrobial, and comfortable mattress. Made with non-toxic materials and free of harmful chemicals, this is an extremely popular crib mattress for good reason. Firmness: It is recommended that infants sleep on a firm mattress to avoid the risk of SIDS or suffocation, so pay attention to this when buying a crib mattress. Breathability: If you want your baby to sleep the entire night, finding a mattress that keeps them cool and comfortable is essential. A breathable mattress that wicks away excess body heat and regulates temperature is a great choice for keeping your baby happy. Waterproof or Washable: All parents know that bedwetting and spills are par for the course when you have a young child, so finding a mattress with a waterproof cover that is removable and washable or, better yet, a 100 percent washable mattress, is essential for minimising stains and keeping your crib mattress clean and hygienic for your baby. Flame Retardants: Most mattresses are treated with flame retardant chemicals to meet federal flammability regulations. However, mattresses can still meet these regulations without the use of any toxic chemicals – this should be a key factor when shopping for a crib mattress if you want to reduce your baby’s exposure to toxic chemicals when sleeping. Overall, there are many crib mattresses that are designed with your baby’s comfort and health in mind. The best organic crib mattresses are the ones that are free from chemicals and any other toxic materials, with well-known certifications to demonstrate these facts. You will probably find that the majority of organic crib mattresses are relatively expensive, but you are paying for a high-quality mattress with features that cater to the needs and safety of infants. All of the options on this list have unique features that make them well worth considering, and hopefully, this review has helped you to narrow down your choices.